Unmanaged Power over Ethernet Industrial switch, four PoE ports and one Fast Ethernet port, IEEE 802.3af compliant. This rugged 4 Port PoE Switch is built for harsh conditions and will operate from -20° to 70° Centigrade (-4° to 158°Fahrenheit). Comtrol’s RocketLinx ES7105 is an IEEE 802.3af compliant 4 Port PoE switch designed for a wide range of industrial PoE applications such as IP surveillance cameras, wireless access point, VoIP phone set, POS system, industrial sensors, controllers and security card readers, where a power source is not conveniently located. 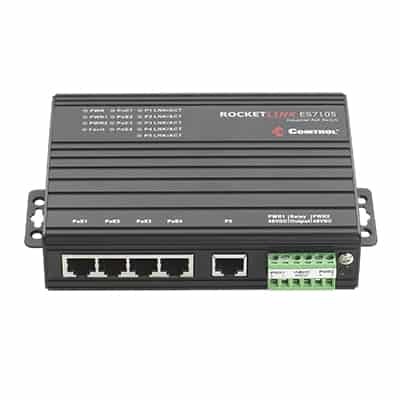 The RocketLinx ES7105 is equipped with 4 PoE injector switch ports, with each port delivering power up to 15.4 watts, and one 10/100BASE-TX uplink port transferring data to the central network. 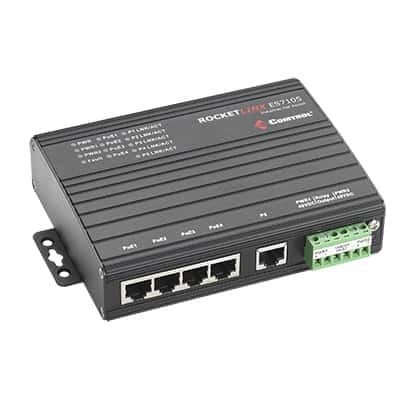 The RocketLinx ES7105 is compliant to the IEEE 802.3af Power over Ethernet (PoE) standard. The Power Over Ethernet technology can power up PoE enabled powered devices in full capability. The ES7105 features convenient wiring with a standard industrial terminal block for the power and relay alarm contact output to alert of any port link failure or power failure. It also provides a DC jack for a traditional AC/DC power adapter. The IP31 rigid aluminum housing and wide operating temperature range ensure reliable operation in places such as mass transit vehicles or outdoor settings. Dimensions 5.6" x 1.45" x 4.4"
RocketLinx® ES7105 Quick Install Guide Quick guide to installation and configuration information. Call +1.957.6000, or visit our forum .